Serving in the United States Coast Guard was among the most valuable experiences of Daniel Wilson's life, providing immeasurable leadership opportunities and camaraderie not found elsewhere. Now Wilson, 34, has begun a new journey--as a full-time student at UCSC, joining a growing population of veterans on a campus more widely known for anti-military protests and countercultural values than for being a welcoming place for service members seeking their next career path. With that public perception in mind, Wilson, other veterans, and the Services for Transfer and Re-entry Students program last week presented the first ever student-led Memorial Day celebration on campus. 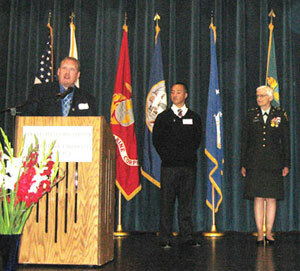 The celebration was held at Stevenson Event Center and attended by nearly 130 veteran and non-veteran students, military officials, community leaders, campus representatives, and others. UCSC has the largest per capita population of veterans of any UC campus, said Wilson, who is president of the UCSC chapter of Student Veterans of America. The campus expects approximately 100 veterans to be among its 16,000 students this fall. In April, the American Council on Education and the Wal-Mart Foundation awarded UCSC a $100,000 grant to support its veterans' programs. "The veterans here love UCSC, and don't like the fact that the campus in some regards has the reputation of not being a veteran-friendly university," said Wilson, who transferred from San Jose City College and is now a junior majoring in ecology and evolutionary biology. "We felt it would be a good idea to take advantage of the opportunity right now with the political climate changes and the student body maybe being more supportive of veterans than they had in past, and move forward with the idea that we could build something out of this." Their goals were to raise awareness of UCSC as a veteran-friendly campus, demonstrate the diversity of the campus's veteran group, and provide information about the resources available to veterans. Mary Hayes, 33, a National Guard member who transferred to UCSC from Hartnell College, said she's gotten a good reception on campus. "I was a little nervous about letting people know that I'm in the service, but I've gotten positive responses from both students and faculty," said Hayes, a psychology major and mother to three children ages 13, 9, and 2. Wednesday's ceremony included a color guard, the Presidio of Monterey Air Force choir, a speech by Colonel Bucky Peterson of Troops to College, and a keynote address by retired U.S. Navy Captain Gordon R. Nakagawa, a Vietnam veteran and POW. "What you're doing on this campus is a tremendous tribute to fallen heroes," Peterson said in his remarks to the audience. In holding such a ceremony, he said, "this university is rising as a model, not just for California, but for the nation." UCSC is "probably one of the most epic schools to host this event because of the perception of it being anti-war," said veteran and Cabrillo College student Tom Marrs, who helped organize the UCSC event and plans to start a Student Veterans of America chapter at Cabrillo. Just being at such an event was a moving experience, said Marrs, 27, who served eight years in the Army and was sent on three deployments to the Middle East. "Everyone who's worn the uniform has so much in common, so it's a great feeling to sit down with other vets," Marrs said. "It's a brotherhood you can't explain." For Lawrence Reeves, who is affiliated with the Naval Postgraduate School Foundation, the celebration felt historic. "We've never had this number of returning veterans from Iraq and Afghanistan and the other conflicts going on, and they're using the GI Bill to go to college," he said, pointing out that veterans from past wars did the same thing and formed the basis of the country's middle class. In fact, he said, some of UCSC's founding pioneers were veterans, including Hal Hyde, vice chancellor of business and finance from 1964-1975. Hyde, who was out of the country and could not attend the Memorial Day ceremony at UCSC, served in infantry combat with the Army in Europe during World War II and retired from the reserves as a Major General.